The alarm sirens started ringing in Chamartín, after Real Madrid dropped another 2 points in a home goalless draw against Valencia. Cristiano Ronaldo was one of the best players on the pitch, as he leaded his side's efforts in rowing against the tide, even though they've all failed to beat Valencia's goalkeeper, Guaita, in many good occasions. 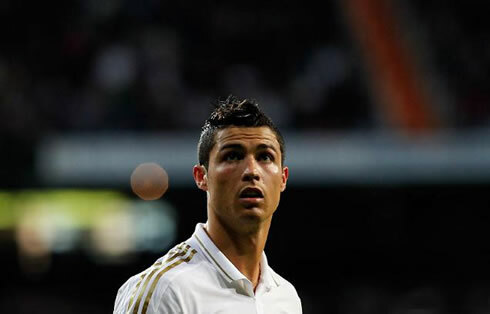 Real Madrid were held to a goalless draw at the Santiago Bernabéu, as they hosted Valencia this Sunday night. Despite having been a very open game, both Real and Valencia wasted several great chances to take the lead, either because of strikes hitting the posts, or simply due to good saves from Iker Casillas and Guaita. As an immediate consequence of tying with Unai Emery's side, the Merengues saw their 6 points lead to Barcelona being cut to 4 points now, since the Blaugrana travelled to Zaragoza this last Saturday, and defated the local side by 1-4. Real Madrid faced Valencia with expectations of collecting another 3 important points that would allow them to keep Barcelona at a 6 points distance. However, even though Valencia aren't exactly a title contender, they also had much at stake on this game, as losing it could make them drop to 5th place in La Liga. Both sides produced a very entertaining game last night, creating plenty of goal scoring chances and putting a lot of intensity in several periods of the match. Although the Merengues had most of the ball possession during the 1st half, there was never the feeling that Valencia have been really against the ropes. Both teams could very well have scored the opener, but for some odd reason, the ball didn't seem to want to get in, no matter how many attempts were made. Cristiano Ronaldo had a powerful strike that smashed into the post close to the 7th minute, as well as a dangerous header after a Gonzalo Higuaín cross, which ended away from the target. As for Valencia, their best opportunity in the 1st half came from a rebound near Real Madrid's area, when Iker Casillas stopped a Tino Costa shot and left an open goal opportunity for Valencia's defender, Ricardo Costa. Luckily to Real Madrid, the Portuguese defender's header hit the post and the goalless draw remained on the scoreline until the half-time. As soon as the 2nd half started, José Mourinho made some changes and sent in Angel Di María for Gonzalo Higuaín. The substitution was very close to produce an immediate effect, since with only 30 seconds on the clock, Di María assisted Cristiano Ronaldo for a left-foot strike, that was brilliantly stopped by Guaita. Desperation gestures started being seen on Ronaldo and several other Real Madrid players, as it was seeming that none of their attempts was enough to get past Valencia's goalkeeper this Sunday night. With Valencia playing on counter-attack and Real Madrid trying to push forward as most as they could, the game was prone in having great goal scoring chances during the 2nd half. Close to the 69th minute, Karim Benzema had a great pass to Cristiano Ronaldo, who made use of his speed to get past Victor Ruiz and saw himself in a 1-on-1 situation with Valencia's goalkeeper. However, just after Ronaldo left Ruiz behind on a sprint, he got slightly touched on his ankle and didn't manage to stay on his feet. The referee didn't rule it as a foul and not only a very dangerous free-kick wasn't granted to Real Madrid, but also a red card wasn't shown to Valencia's defender. Both sides kept increasing the pace and the opener seemed to be just around the corner. However, among many reasons such as balls hitting posts, lack of luck, goalkeepers saves or simply because of bad finishes, none of the teams found a way to score the opener and get the precious lead. Valencia's best player had to be their goalkeeper, Guaita, while on Real Madrid's side, Cristiano Ronaldo's resilience definitely deserved better luck. The Portuguese forward is now 2nd in La Liga's Pichchi standings with 37 goals, just one goal behind Lionel Messi (38), who scored another two this last Saturday, against Real Zaragoza. 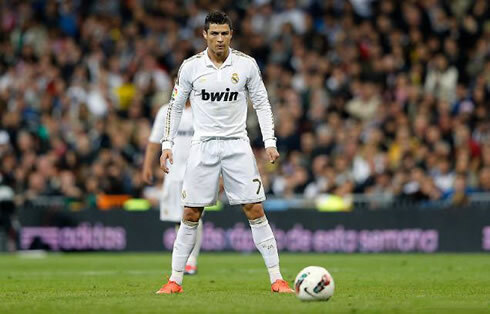 Real Madrid next game is for La Liga, against Atletico Madrid, this next Wednesday (11-03-2012). In the meanwhile, you can watch Sporting vs Benfica, Tottenham vs Norwich, Fulham vs Chelsea, all from our soccer live streams section. Cristiano Ronaldo is expected to be on the line-up, when Real Madrid visits their city rivals, Atletico Madrid, this next Wednesday.